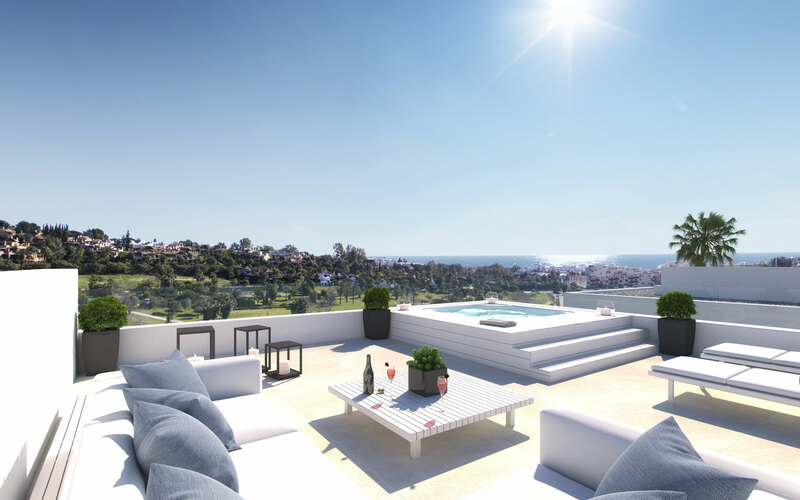 A new boutique development of beautiful villas all with mountain, golf and sea views designed to Scandinavian standards that adapt seamlessly to the Mediterranean lifestyle located in a desirable position in El Campanario. Located in the heart of the New Golden Mile near to several luxury hotels, spas , beach clubs, marinas and several fine golf courses . Nearby, Puerto Banus and Marbella provide a variety of choice for both shopping, fine dining, sports, recreational, wellness activities and entertainment for all the family. The delightful towns of San Pedro and Estepona are also a short drive from these elegant homes. Malaga International Airport is only a 40 minutes drive. Making this development is the ideal choice for a second residence on the Costa del Sol. Within walking distance of the clubhouse of El Campanario Golf Club that offers a restaurant, bar, spa and fully equipped gymnasium, indoor heated pool, paddel tennis court and outdoor pool set in landscaped gardens. As a home owner you will receive a years Family Membership to Campanario Golf and Country House Club. The open plan concept of the ground floor connects the living and dining spaces with the kitchen, which includes the latest design and is spacious with a central island featuring top quality appliances from Siemens. The use of large full length Windows, connects the indoor and outdoor living spaces.to offer the best of Mediterranean living. On the upper level there is 3 beautifully designed bedrooms each with its own en-suite bathroom. The Master suite is spacious and features a dressing area and is connected to the bathroom by a glass wall . The other bedrooms and bathrooms have been designed with care and every last detail from the underfloor heating, sanitary ware and flooring to the colour of the walls chosen to provide a relaxing environment in which to enjoy the home. The solarium on the top of the villas will enjoy 360º panoramic sea and golf views with a backdrop of the Marbella mountain range. This unique living space can be personalised by each homeowner to suit their lifestyle and individual requirements; an open air bbq and dining area, chill out relaxation area or jacuzzi are a few of the options to enjoy the views during the day or admire the stars at night. The villas offer unlimited possibilities as the basements also allow homeowners the option to adapt this area to suit their families lifestyle . With a large space of over 150m2 with natural light and direct access to the gardens this incredible space can be home to more bedrooms, a guest suite, lounge area, home cinema, gymnasium or sauna. Water plays an important part of the architecture and this is visible in the design of the infinity pool with its waterfall feature that blends harmoniously with the landscaped gardens. The quality of the finishes determines the quality of the home. Much thought and detail has gone into this and is reflected in the lacquered interior carpentry, the floor to ceiling sliding glass doors, the interior and exterior large format porcelain flooring, the quality of the fully fitted wardrobes, the Italian sanitary ware in the bathrooms and much more. The home also benefits from the pre-installation of a home automation system, fibre optic Wi-Fi and the pre-installation of an alarm system for total peace of mind. Designed to achieve the lowest energy consumption that protects our environment yet at the same time provides the owner with a total sense of comfort and well being inside their home.